Study Finds The Poor Subject To Unfair Fines, Driver's License Suspensions : The Two-Way The report says many of the police and court practices highlighted in a recent federal investigation into the Ferguson, Mo., police department occur in California as well. Researchers conclude that tickets and fines hit the poor harder than other Californians. Nonpayment brings additional punishments such as heavy fines and driver's license suspensions. A new report says an issue highlighted recently in Ferguson, Mo. — that tickets and fines disproportionately burden people of color and the poor, and lead to their incarceration — is not limited to Missouri. The Lawyers' Committee for Civil Rights of the San Francisco Bay Area finds that California is dealing with the same problems, specifically in regard to driver's license suspensions. The report says, "Due to increased fines and fees and reduced access to courts, more than four million Californians have suspended driver's licenses. These suspensions make it harder for people to get and keep jobs, harm credit ratings and raise public safety concerns." The study says "a litany of practices and policies turn a citation offense into a poverty sentence," with add-on fees for minor offenses sometimes doubling or quadrupling the original fines. And the report says that once people's licenses are suspended as a result of the tickets and fines, they become even more unable to pay their debts, entering "long cycles of poverty that are difficult, if not impossible to overcome." The study says in total, California has over $10 billion in uncollected court-ordered debt and that the state uses the heavy fines as a source of revenue. The report speaks of several specific cases, like a 22-year-old single father named Andrew who stopped making payments on his traffic tickets after he left his job to care for a son with leukemia. That suspension jeopardized his son's treatment, according to the report. A woman, Tammi, owed over $3,500 for several unpaid traffic tickets that she didn't even think were hers. 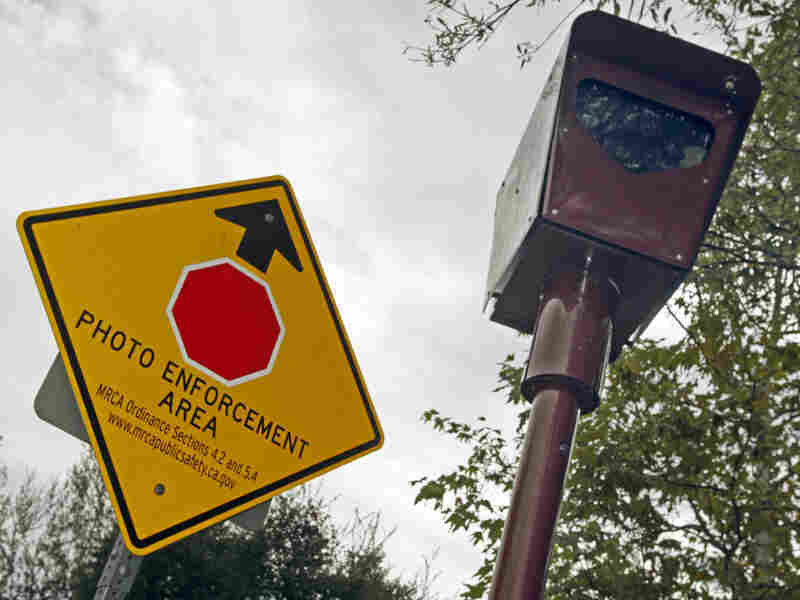 A lawyer for the committee, Meredith Desautels, spoke with NPR member station KQED and elaborated on California's fines. Desautels says the report doesn't address serious criminal offenders, but normal people who violate minor laws. Fees and fines are being assessed for low-level offenses — a broken tail light, speeding, jaywalking. But what looks like a $100 ticket comes with some hefty add-ons: Once you tack on all the automatic state and county fees, that $100 total jumps to $490. If you miss your court date or deadline to pay, the fine jumps again, to $815. If a person doesn't have $490, they probably don't have $815, Desautels said — and if they don't pay, they are likely to have their license suspended. Compounding these woes, she said, after individuals lose their licenses, courts are often unwilling to schedule a hearing with a judge until the fines are paid off. The study recommends that the state of California "end the use of license suspensions as a collection tool for citation-related debt, allowing more people to work and pay their debts." The report also says that the cost of paying a ticket is too high for everyone, not just the poor. The Lawyers' Committee suggests that current fees be cut in half and that fines be based on an offender's ability to pay. The group also suggests an amnesty plan for Californians who have already had their licenses suspended — one that would restore their ability to drive and forgive the debt of "the poorest Californians." KQED previously reported on similar findings from the U.S. Department of Justice's investigation into the Ferguson Police Department, which "found that in Ferguson, Missouri, a small city with a population of just 21,000, more than 16,000 people had outstanding arrest warrants issued by the court as of December 2014," with many of those warrants having "nothing to do with criminal behavior." Months of protests over the killing of unarmed black teen Michael Brown by a Ferguson police officer led to the investigation. NPR's Joseph Shapiro has reported extensively on the issue as well, finding that some parts of Missouri led operations that almost functioned as debtor's prisons, with judges letting jail time count toward paying off court fees.